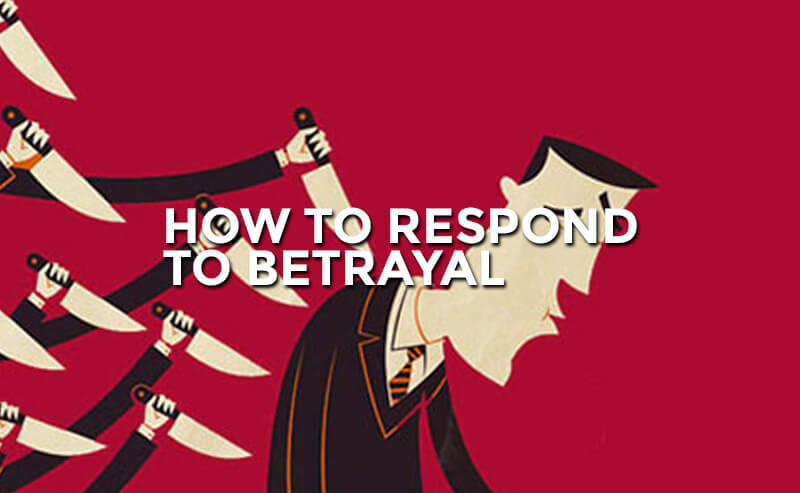 Blog How Do I Respond To Betrayal? How Do I Respond To Betrayal? 1 Then Joseph could not control himself before all those who stood by him. He cried, “Make everyone go out from me.” So no one stayed with him when Joseph made himself known to his brothers. 2 And he wept aloud, so that the Egyptians heard it, and the household of Pharaoh heard it. 3 And Joseph said to his brothers, “I am Joseph! Is my father still alive?” But his brothers could not answer him, for they were dismayed at his presence. 4 So Joseph said to his brothers, “Come near to me, please.” And they came near. And he said, “I am your brother, Joseph, whom you sold into Egypt. 5 And now do not be distressed or angry with yourselves because you sold me here, for God sent me before you to preserve life. 6 For the famine has been in the land these two years, and there are yet five years in which there will be neither plowing nor harvest. 7 And God sent me before you to preserve for you a remnant on earth, and to keep alive for you many survivors. 8 So it was not you who sent me here, but God. He has made me a father to Pharaoh, and lord of all his house and ruler over all the land of Egypt. This passage contains one of the most clear and comprehensive examples of the relationship between the choice of man and the sovereignty of God. On one hand, Joseph attributes his brother’s actions to their own wills. Yet, on the other hand, Joseph attributes his brother’s actions to God’s sovereign hand. So what does this mean for us? It means that we don’t get a free pass on our actions simply because God uses them for his purposes. He is fully in control of all that we do, and yet we are fully responsible for every decision that we make. God does not force us to do anything. So why does God choose to use sinful people like Joseph’s brothers to carry out his will? This question can be answered by asking another question – Where is God going to find a sinless person!? 23 For all have sinned, and come short of the glory of God. Everything God does in accomplishing his will involves the use of sinful people and their sinful choices. So how do we handle being sinned against? I’m so intrigued by the way that Joseph responds to his brothers betrayal. I’m amazed at how he handles the situation. If I was kidnapped and sold into lifelong slavery, I’m not sure if I’d ever get over it. So how does Joseph move past all his suffering and pain? In the speech he delivers to his brothers it becomes clear that Joseph thoroughly understands two things – theology and anthropology. Proper theology will keep us from accusing God of evil as he mysteriously works in and through our lives. When we find ourselves in difficult situations we will be less likely to think that God’s primary job is preventing inconvenience in our lives. Proper anthropology will keep us from thinking more of people than we should. It will remind us that people are sinful and weak. People will always fail us, always hurt us, always disappoint us, and (by God’s grace) sometimes bless us. However, none of this ever happens outside of God’s providential plan. The reality is that we will all experience hardship at sometime or another. But the question remains, how will we respond? Will we become bitter and angry towards God? Will we choose to have such a shallow view of him that we actually think his sole reason for existence is to spare us any and all inconvenience? Or will we be among those who idolize certain people? Perhaps a parent, a spouse, or even a pastor. When these people inevitably disappoints us, will we be healed quickly or will we be completely crushed? Over the course of my time in ministry I’ve witnessed two types of people. I’ve seen some people experience pain, hurt, and disappointment that causes them to question everything. Their suffering quickly creates a distance between them and God and/or them and the church. However, I’ve also seen some people experience some of the worst pain imaginable while maintaining immense love for both God and people. So what makes the difference? I truly believe it all comes down to the way we choose to view God and our fellow man. We cannot hold too shallow of a view of God, and we cannot think too highly of people.